Check it out! A nail polish swatch! And seasonally appropriate, no less. Who’d’ve thunk, on a nail polish blog? Yes, I’m finally back to swatching. Apologies for the state of my cuticles, however. The transition to fall and constant handwashing have not been kind—Sally Hansen Cuticle Remover, you’re letting me down! I have to do a better job for the next swatch. 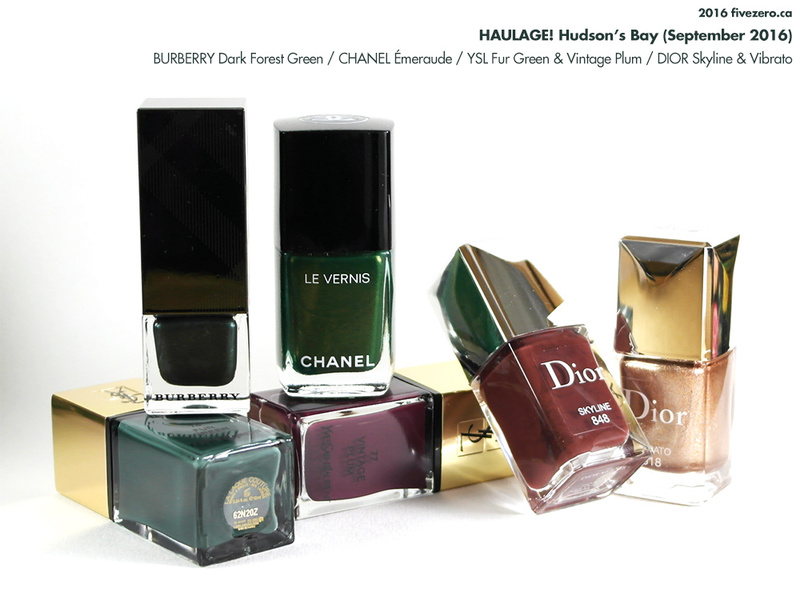 Yves Saint Laurent Beauté recently released a fall collection called Scandal, which includes two vampy nail polishes: Fur Green (76) and Vintage Plum (77). I picked up both during a Hudson’s Bay sale, so today I have a swatch and review for Vintage Plum. 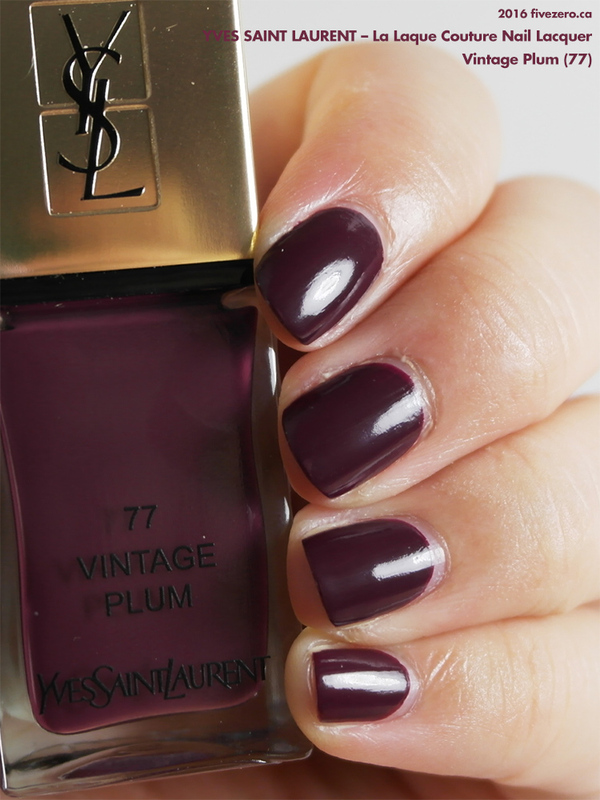 Vintage Plum (77) is exactly the kind of vampy shade I love: deep, intense, and definitely not black. This velvety plum is well-balanced, as it doesn’t pull too red or blue. I can see it going with practically anything! The polish dried to a smooth, glossy shine. The pigmentation is incredibly good, though you’ll still want two coats for perfect coverage. Perhaps it’s not the most unique color in the world, but it’s still well-executed and a stunner, and the quality is high. I recommend it if you want a non-red vampy that remains elegant and relatively conservative. The packaging does feel expensive, though I find YSL’s makeup packaging to generally be on the gaudy side. I think that YSL have changed their brush, however: the Jade Impérial I bought last year had a squared brush, but Vintage Plum has a rounded, paddle-shaped brush. Both are quite wide. I find this new brush a tad unwieldy for my smaller nails, but it doesn’t pose too much of an issue unless I’m dealing with my pinkies (or my little toes). 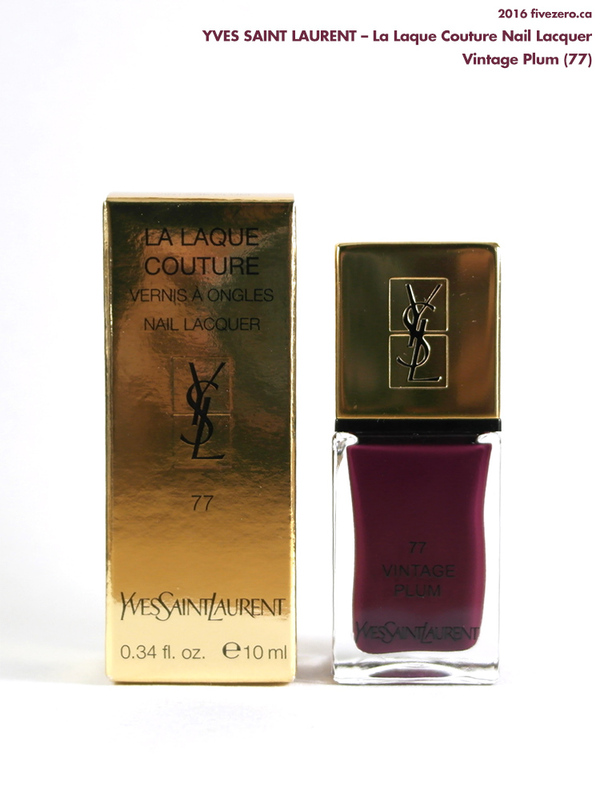 Yves Saint Laurent La Laque Couture Nail Lacquer is US/CA$31 and 0.34 fl oz / 10 mL. The formula is free of toluene, formaldehyde, and dibutyl phthalate (DBP). It is made in France. Pretty Colour! Nice for fall. 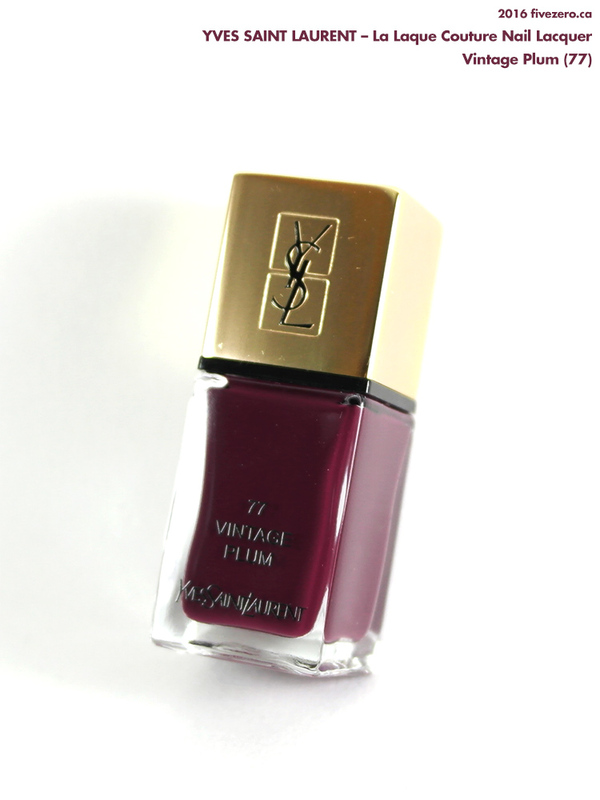 Still haven’t splashed the cash on any YSL polishes! They’re certainly very good, though I’m not a huge fan of the packaging! Very beautiful and vampy! Love it! I’m so glad it’s vampy season again! I like that this still registers plum – I hate it when vampy = black. And yeah… that Hudson’s Bay sale. I got back just in time to get the coupon in the mail and although tempted, I was good, I didn’t buy anything! 😛 It was a pretty decent sale for the Bay…usually makeup/fragrances are exempt from their sales (along with practically anything else, have you seen their list of sale restrictions? jeez, why not let us know what isn’t restricted?). I snagged a few clearance OPIs as well, which helped me to hit that $100 mark very closely! Plus ebates and I was a happy camper. the polish is very pretty. and I agree, YSL packaging looks so gaudy. I own some pieces I’ve had for years and they got scratched and they really don’t look great anymore. 😦 I don’t have this sort of problem with my other luxury brand pieces.